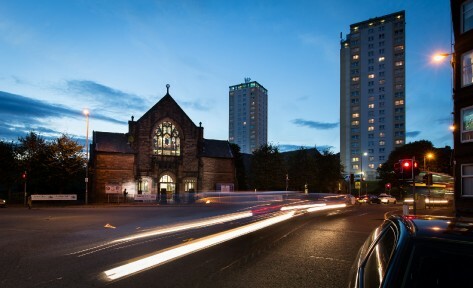 Thomas Robinson Architects have been involved in the successful refurbishment of Clincarthill Parish Church in the South Side of Glasgow. The church, formed when the congregations of the former Battlefield East and Mount Florida parishes were united back in June 2010, marked the completion of the works with a "New Beginnings" service of dedication. Clincarthill consists of the two former Battlefield East B Listed buildings which required major improvements following the union. Thomas Robinson Architects were appointed after impressing with their proposals which respected the architecture of the existing buildings whilst modernising the look and function of the interior spaces. Parish minister, the Reverend Mike Gargrave, is delighted with the end result which includes a refurbished sanctuary with extended chancel, creation of a small chapel and meeting room, new lighting and an audio visual system. The vestibule has been remodelled with new windows which allow more natural light to flood the sanctuary, the smaller of the two halls has been refitted and the leaded glass windows in the main hall replaced. A kitchen which can cater for 200 people has been created and a new central heating system installed throughout the building. Toilets have been totally refitted, including a new wheel-chair accessible facility and baby changing area. Members of the congregation were involved at every stage of the process and Mr Gargrave believes they have realised their dream of having a modern refurbished church with facilities which can be enjoyed by the local community. He said: "Architects Tom Robinson and Natasha Houchin worked very closely with us. They were aware of the heritage of the building and worked hard to bring the contemporary into the traditional in a sympathetic and appropriate way." Project architect Natasha, whose experience of multi-use church buildings in Canada helped in the discussions with Clincarthill groups, outlined TRA's approach to the challenges the project presented. She said: "The aim was to create an architecture that reflects the beliefs of the ministry and reaches out into the community to bring more people in to use the church and be a part of the congregation." Tom noted: "This project, and also our other church work, has helped our practice develop a range of solutions to what are often common or typical problems for churches. Inevitably, the application of those solutions is bespoke for each project but a lot of thinking time can be saved just by taking the right approach in finding out what might be right for a particular congregation." Tom and Natasha attended the New Beginnings Service and Tom added: "It was a delight to see the church and halls in full swing after many months of hard work by the church, the design team and the contractor. The new kitchen was in use for coffee and teas after the service and all of the new facilities were functioning well."